La-La Land Records, Warner Bros., Warner Bros. 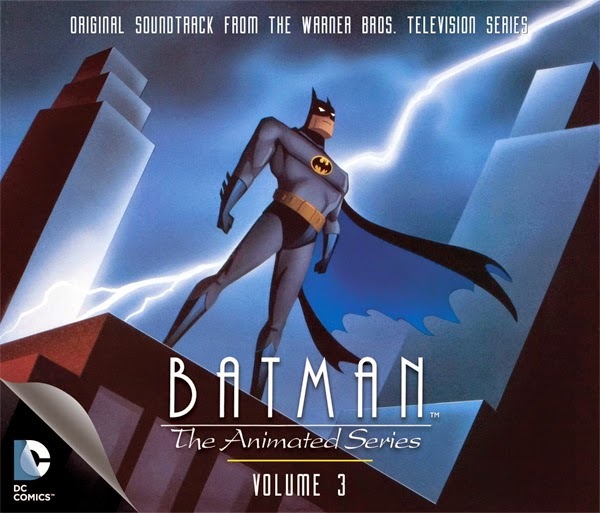 Animation and DC Comics proudly present BATMAN THE ANIMATED SERIES: VOLUME 3, a limited edition 4-CD SET of unforgettable musical moments from the acclaimed BATMAN THE ANIMATED SERIES. These remarkable scores are game-changers in the world of television animation music, packing supercharged thrills, chills, action and drama within an emotional, musical whirlwind that rivals most blockbuster film scores. Music from such notable episodes as ROBIN’S RECKONING, ETERNAL YOUTH, DAY OF THE SAMURAI, MUDSLIDE, THE CLOCK KING and more are presented here in a knockout compilation with a combined running time of more than five hours! Produced by John Takis and Neil S. Bulk, and mastered by James Nelson, this limited edition of 3000 units features a 36-Page booklet bursting with amazing images and in-depth liner notes and analysis by John Takis. The heroic art design by Dan Goldwasser compliments this impressive volume with gothic flair. Just Announced, I don't even have to tell you... go, go now!